When it comes to knife discussions we often tend to focus more on the actual knife than the sheath. Often blade steel, edge profile and knife size are more debated than the design of the sheath or pouch surrounding the knife. 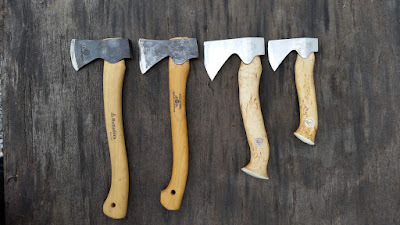 I think we need to focus more on the carry systems of our knives, and how we carry them, to get the most out of our tools and the experiences they enables us. 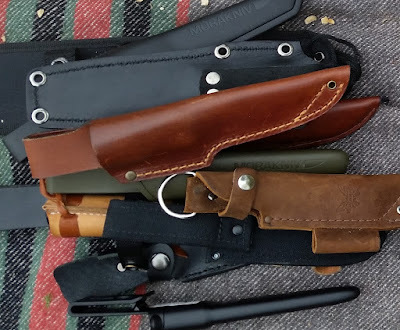 Fact is that fixed blade knives and bigger folders spend their life time mostly inside their carry systems (sheaths and pouches). Now, let us dig deeper into this great and nerdy topic! For instance; when I'm out hiking a long trail my knife spend most of it's time inside the sheath. Therefore during a long hike like this I prioritize how well my knife is fitted on to my body, rather than what type of steel the blade is made of. 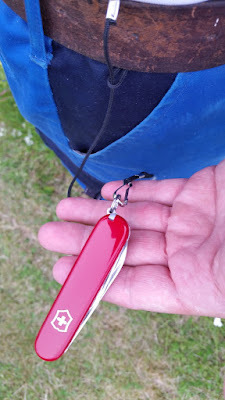 A lot of hikes has been disturbed by an annoying knife banging into my leg or giving me a chafe in the side. So to avoid disturbance and the risk of loosing the knife I might carry the knife inside the backpack instead. 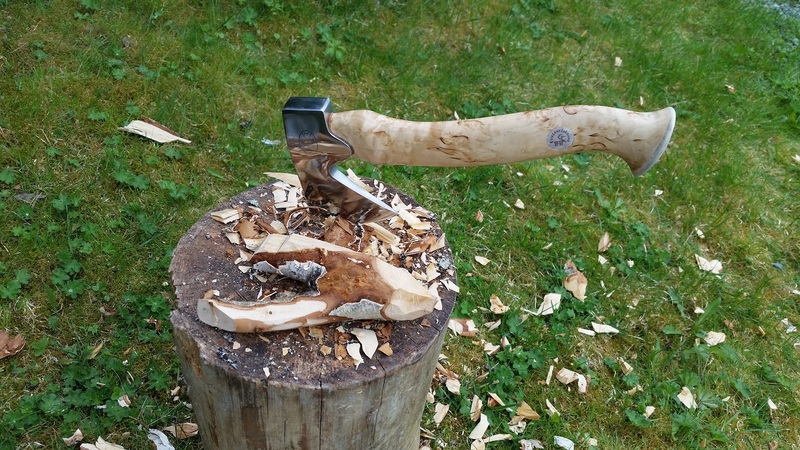 The most important aspect when choosing my edge tool is; what kind of activities am I'm planning to do. I'll probably not gonna pick the same knife for a one day ice fishing trip as for a long mountain hike. This also goes for how I choose to carry my knife. One and the same knife I will perhaps carry in two or three different ways depending on the upcoming activity. So even if we tend to focus more on the actual knife than it's sheath; the carry system is essential to how I experience the knife. It doesn't matter if I have a great and expensive knife if the carry system doesn't enables a comfortable and safe carry. Even so; unfortunately, knife manufacturers all over the world tend to cut down the product cost by not prioritizing the carry system as high as they should. However; luckily, there are still some knife manufacturers that take pride in making high quality carry systems for their tools. I notice this by looking at the quality of the chosen materials and how well the components are fitted and attached to each other. 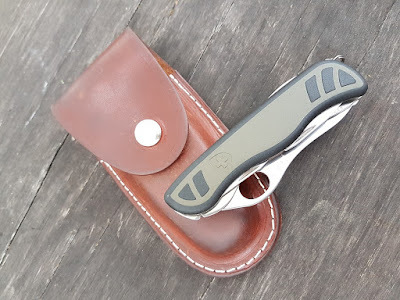 A big and heavy knife can actually feel lighter, compared to a smaller blade, if the maker have designed a well functioning and well fitted carry system, distributing the weight in a comfortable and well balanced way. Another interesting aspect is the balance between how well the tool is secured in it's carry system, and how easy accessible the tool is to the user. 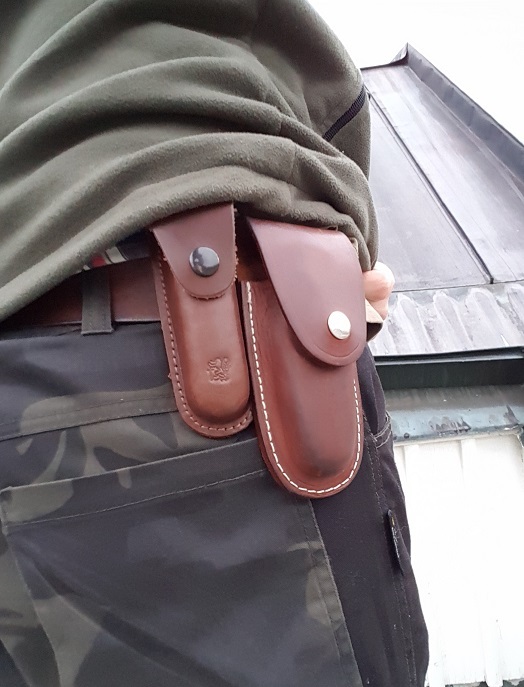 I prefer to always have my knife close at hand and to be able to only use one hand when taking it out of the sheath, without having to open up velcro, straps and buttons. 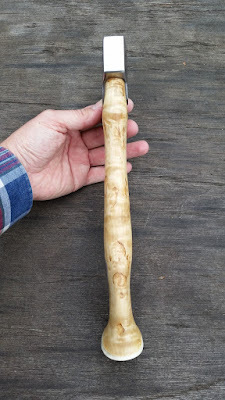 However; at the same time it's important to me that I don't risk loosing my blade out in the field if the knife sits too lose inside the sheath. 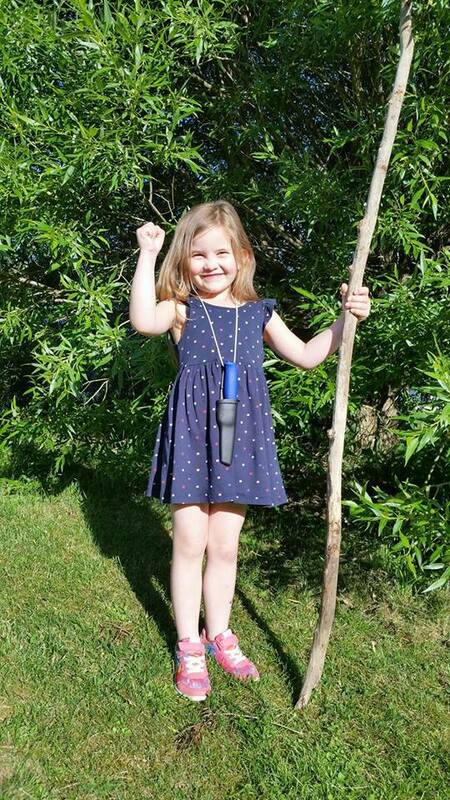 Fortunately enough there are a wide range of design solutions on how to secure a tool in it's carry system. I will not get into all of these right now. 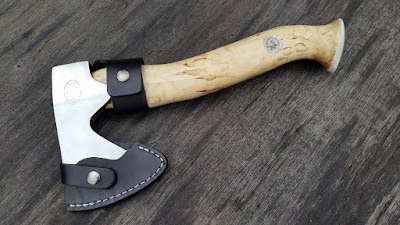 However I can say that I usually prefer design concepts where it's the friction between the knife handle and the sheath that secure the knife inside the sheath. Below follows a number of examples on how to carry a knife. Smaller folders I often carry loose inside my trousers pocket and sometimes inside a jacket pocket, hence the denomination Pocket Knife. The definition of a smaller knife in this case means a folder that isn't to big or heavy to bother or chafe inside my pocket. When carrying a knife loose inside my pocket it's important to calculate how big of a risk it is that the tool falls out of the pocket unintentionally. On some pockets without lid, zippers or buttons this risk can occur when being seated inside a car or when climbing, running and crawling. 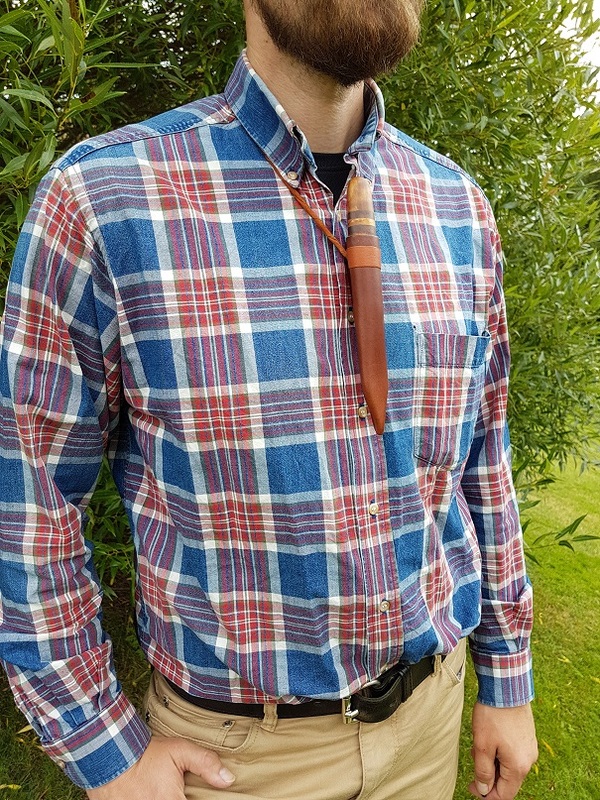 If that is the case; I use a longer lanyard attached to the knife in one end and to my belt at the other. This longer lanyard (about 55 cm) enables me to pick up and use the knife usually without having to remove the lanyard from my belt or knife. 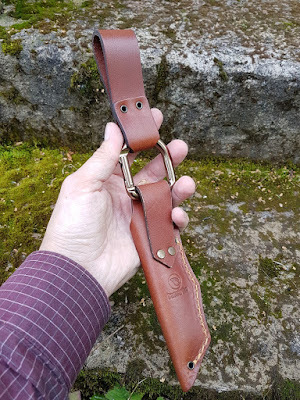 I'm attaching the lanyard around my belt instead of the belt loops of the trousers, as the belt loops may brake if the lanyard get stuck on something. 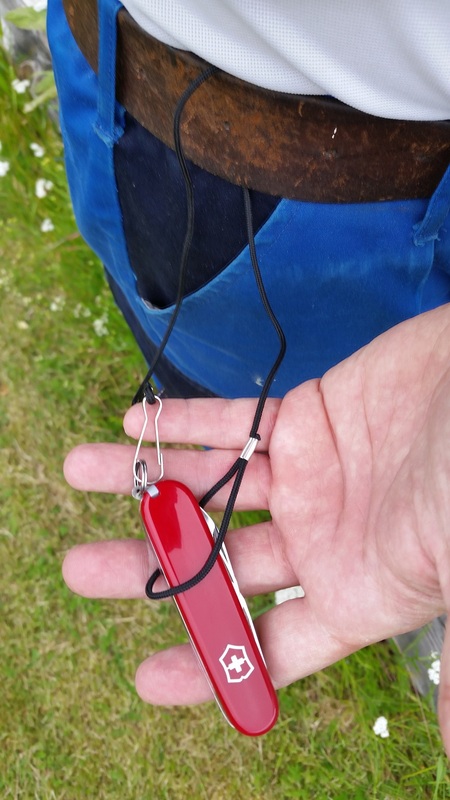 If I carry the knife inside a jacket the same lanyard can be attached to the jacket instead. When I carry my knife loose inside a pocket I regularly turn the pocket inside out to shake off any rubbish from inside the pocket. I don't want this dirt to get stuck inside my knife's folding mechanism. Some folders has a ring or a hole to attach the lanyard. Folders of the right size using a pocket clip can be attached to the same lanyard and carried inside the pocket. 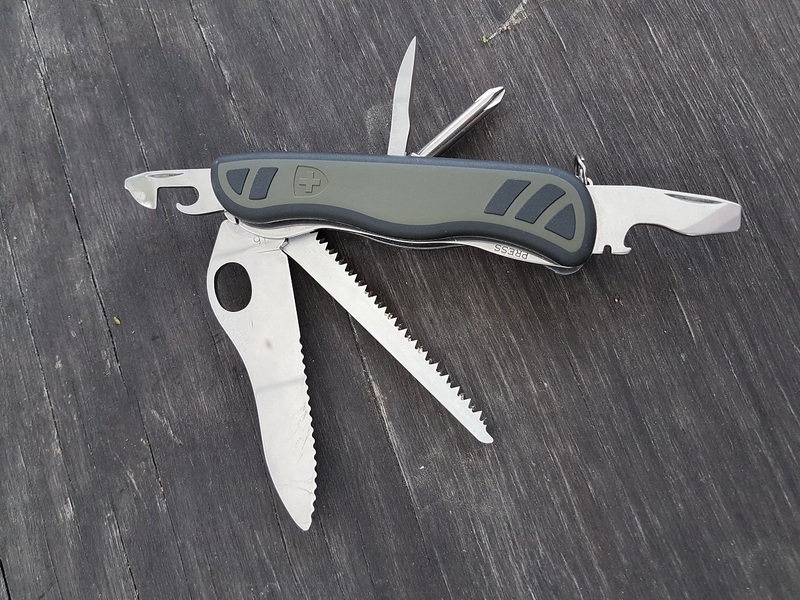 then the pocket clip enables you to remove the knife from the lanyard if necessary. 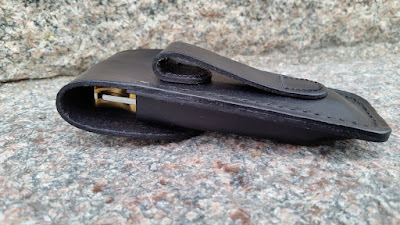 Folders equipped with a pocket clip (a flexible metal tongue) can be carried pinched on top of my pocket. 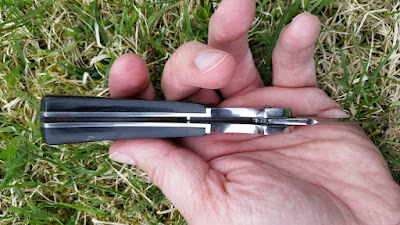 This is a good way not to tear on the pocket liner (textile) and at the same time lower the risk of getting pocket dirt stuck in the folders pivot mechanism. Note that this way of carrying your blade is more visual compared to carrying the folder all the way down inside the pocket. Please show humble respect and concern when operating in a sensitive environment. Some people may be offended. Personally I prefer carrying my pocket clip folders tip down. 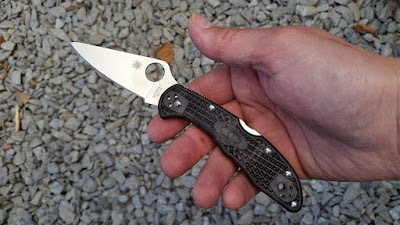 Today some knife manufacturers use the clever design of offering four different set ups of holes for the user to choose and adjust how to mount the pocket clip on the knife; tip up, tip down, left or right handed. This choice is desided by how I want to grab and open my folder, especially if the folder is equipped with a one hand opening feature (thumb hole, plate or stud). An alternative usage of a pocket clip is by using a separate one, just like the one seen above. This allows for my folder to hang freely further down inside my pocket, still not touching the bottom of my pocket. The most common way of carrying a knife is by letting the sheath or the pouch hang in the belt around my waist. 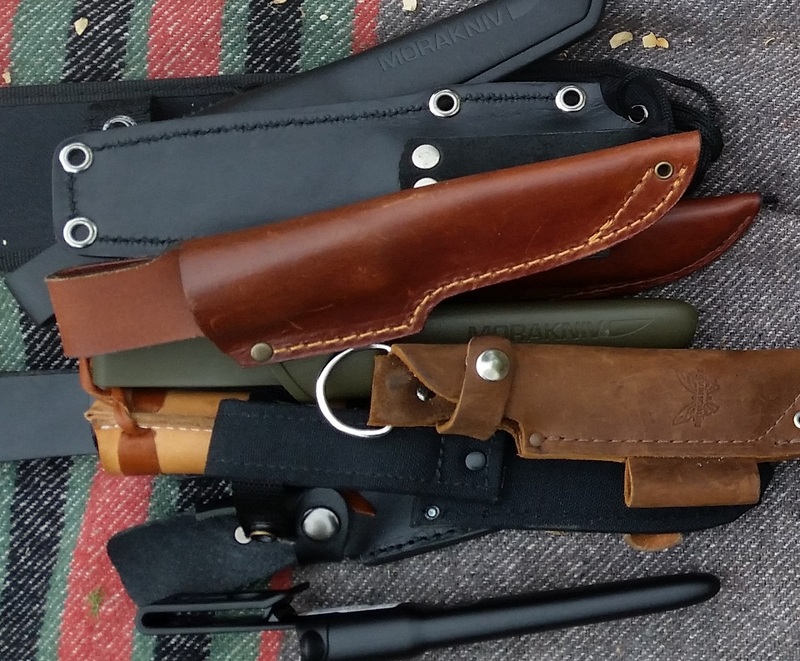 Most fixed blade sheaths and folder pouches are equipped with a loop or one or several slits to run my belt thorough. The two most common fixed blade sheath designs are; high carry and low carry. Usually high carry means that the knife handle is placed almost at the same height as the belt, tip down. 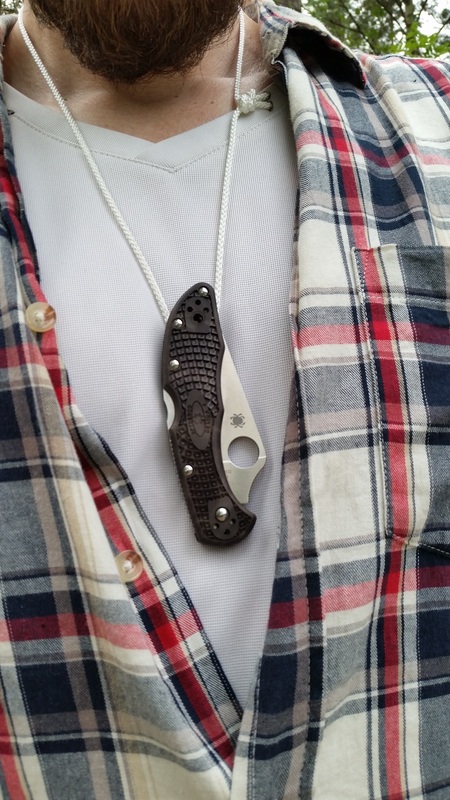 Low carry means that the whole knife is hanging below the belt line, tip down. Good aspects of the high carry is that the knife is secured tight against my body not risking to get stuck or slam into my surroundings. The up side of a low carry is that the knife can hang freely beneath my backpack's waist belt. 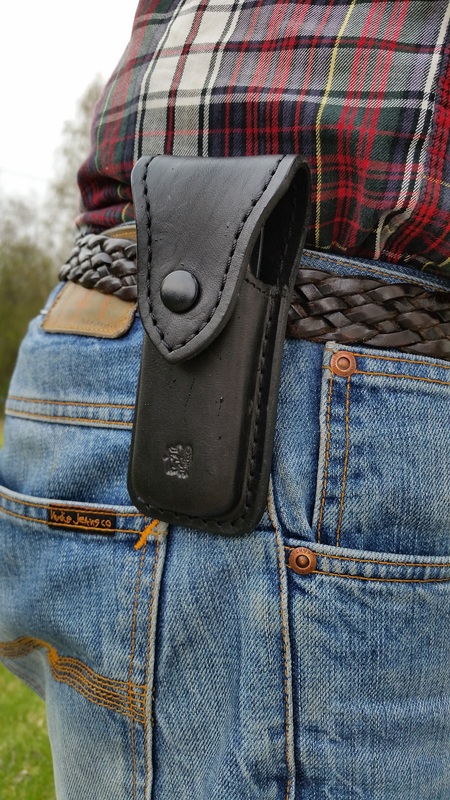 Sheahts, pouches and holsters sometimes have different designs for left or right handed carry. Either way; it's up to me where to place my knife along the belt line. 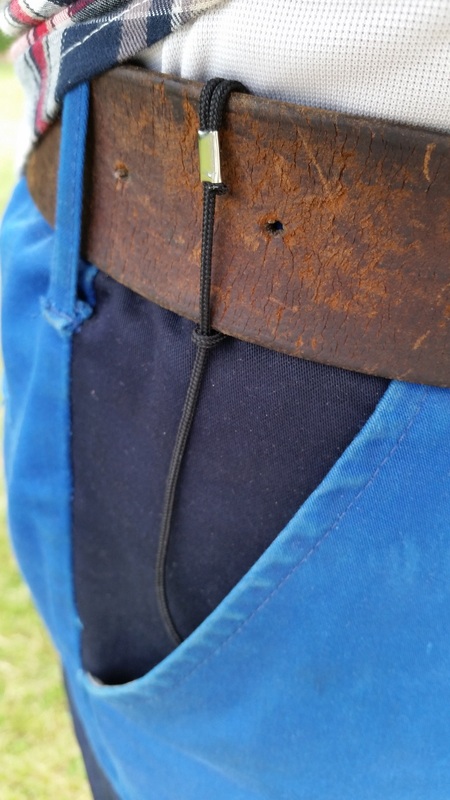 This also goes for knives carried horizontal; placing the knife parallel to the belt. 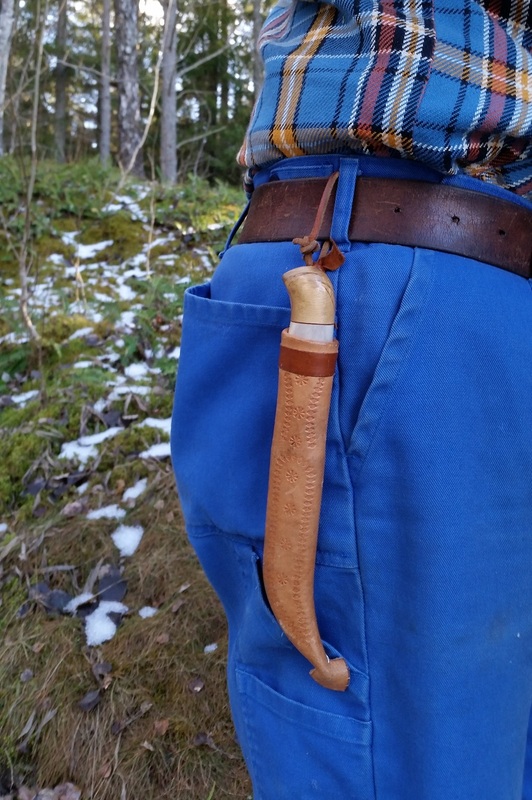 This is a nice way of carrying especially larger blades on my waist. 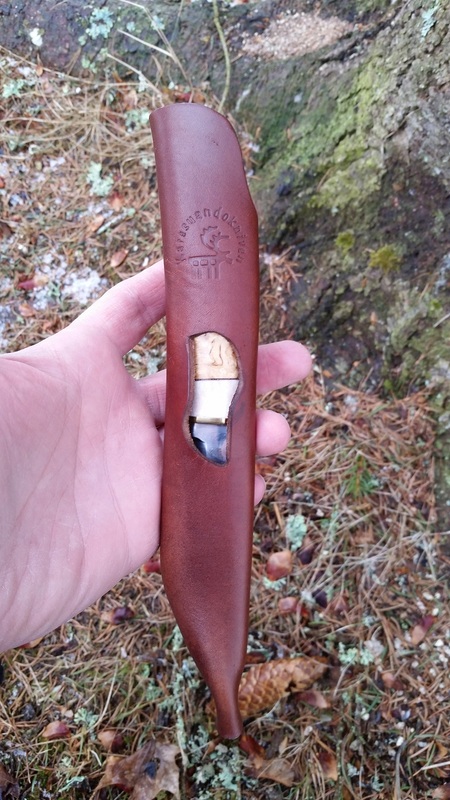 A Cold Steel Master Hunter in a custom sheath made by Mr. Eric E Noeldechen. 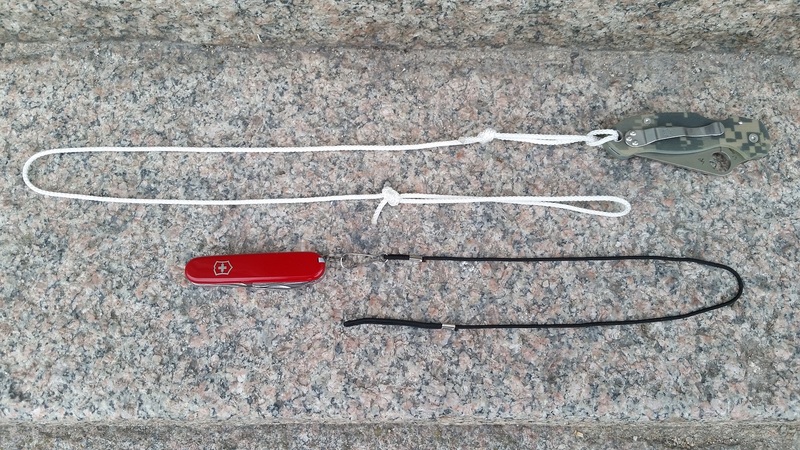 A high carry system often can be converted into a low carry by adding a loop or a carabiner. The carabiner also allows me to easily remove the knife from my belt without having to open and remove my belt from my trouser's belt loops. A especially designed alternative to a regular carabiner is the Casström No.3 Dangler. Some people mean that the high carry placing the knife tight against the body allows for an easier one-hand grab when taking out one's knife. 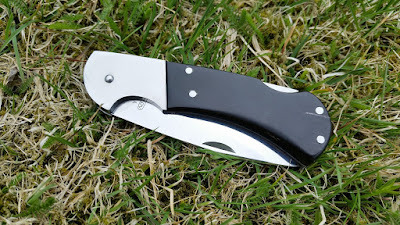 But in my opinion the low carry knives also can be grabbed one-hand-only by pushing the sheath forward using my thumb pulling out the knife from the carry system. One alternative in this case can be a sheath equipped with a small hole allowing for my finger to press up the knife handle for a one handed access to my knife. One example of this concept is the Karesuandoknivens Johtalit shown below. 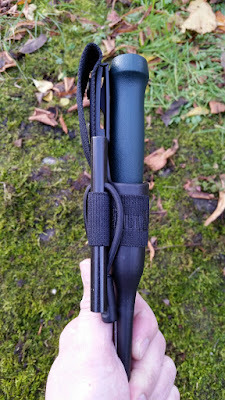 If I have to mention some down sides of carrying my tools on my belt is that they can be in the way when crawling on the ground, sitting down or sneaking around in the bush hunting. When ever I feel this is an issue; I instead choose to carry my tools inside my pockets, inside my backpack or hanging around my neck. 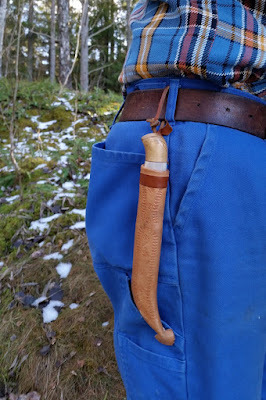 If there's ever a risk of me sitting down up on a low carry tool it's especially important that the sheath features a plastic or antler inlay for safety. 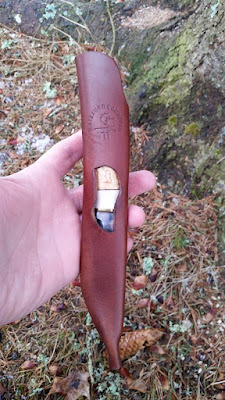 I've experienced a fixed blade going through the sheath tip almost penetrating my inner thigh while I was squatting down. When carrying a bag of some sort I always have the option of carrying my tools inside the bag. This is especially interesting for occasions when the blade is not used frequently or when I'm carrying a large and heavy knife. 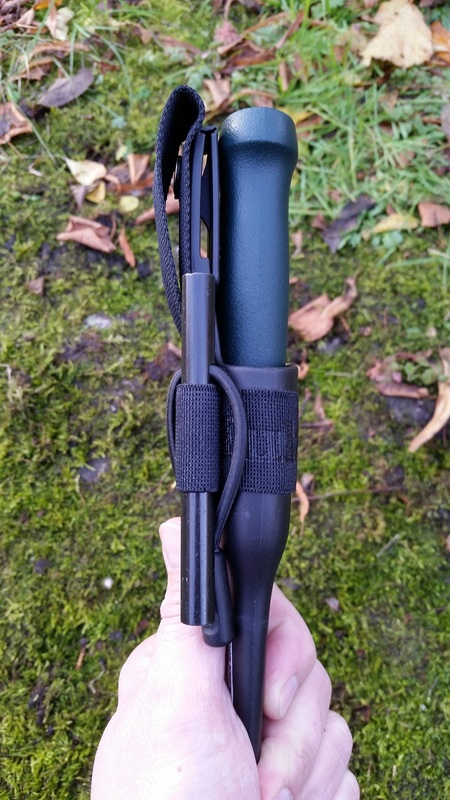 If I want to snap up the accessibility a notch I can strap or hang my knife on the outside of my bag. This enables me to reach the tool without having to open the bag each time. When attaching tools to my bag it's important to secure the knife inside the carry system aswell as securing the carry system properly to the bag. When carrying my knife tight against my body it's easier to feel if the knife is unintentionally dropped. But when the knife is attached to my backpack it's harder for me to feel this. Examples on where to place the knife outside my backpack is; on the top lid, along the side of the bag or attached parallel on one of the carrying straps. The above also goes for when I'm attaching my knife to a jacket or a vest. I like carrying my knife hanging around my neck. It's practical when carrying a not to big or heavy knife. It's especially useful when dressed for winter. The neck knife can hang outside the clothes for me not having to lift up or undress to reach my waist line. 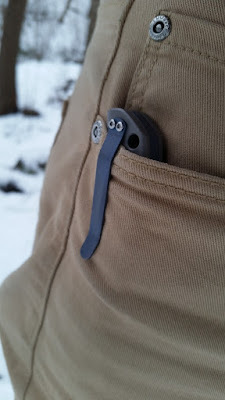 The neck knife carry is also great when wearing light pants without a belt and pockets. A Jonas Vildmark Doer hanging around my neck. 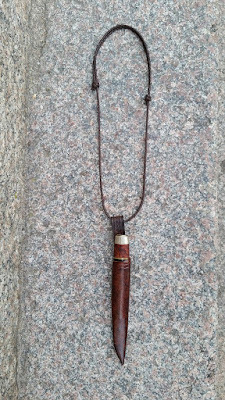 One way is to just take a regular fixed blade knife an run a cordage through the belt loop of the sheath and then hang the "neck less" around my neck with the knife tip down. I can do a fixed knot or an adjustable knot on the string. 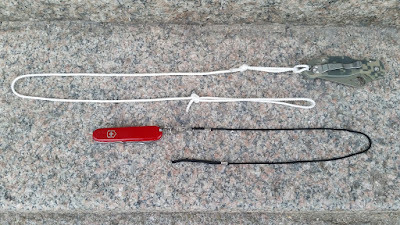 The length of the cordage should be just as long so I can apply the neck knife over my bare head. The knife should not be hanging too far down on my chest risking to get tangled or bumping into me or other objects. 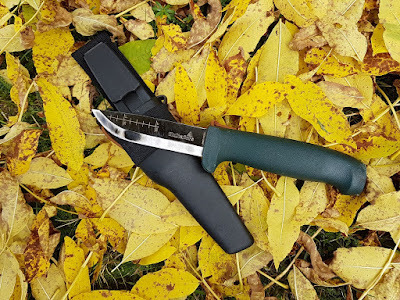 Another alternative is when the fixed blade knife is so secure inside the sheath that I can mount the knife tip up without risking the knife falling out from the sheath. These carry systems are usually meant for up side down carry using materials like; plastic, Kydex or Zytel. This way of carrying offer a very quick accessible knife by just grabbing the handle and pulling downwards. This demands a high friction between knife and sheath to hold the knife secure when hanging up side down. The strap around the neck principal is the same as above only it's extra important that the cordage doesn't break when pulling down on the carry system. 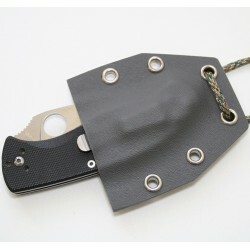 There are also Kydex sheaths that enables friction locked up side down carry for folders, as seen in the picture below. 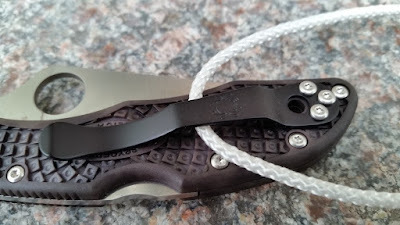 A great way of utilizing the neck cordage is to hook up a pocket clip folder to it. If the folder isn't too heavy this is a practical alternative to carrying the folder on my pocket. 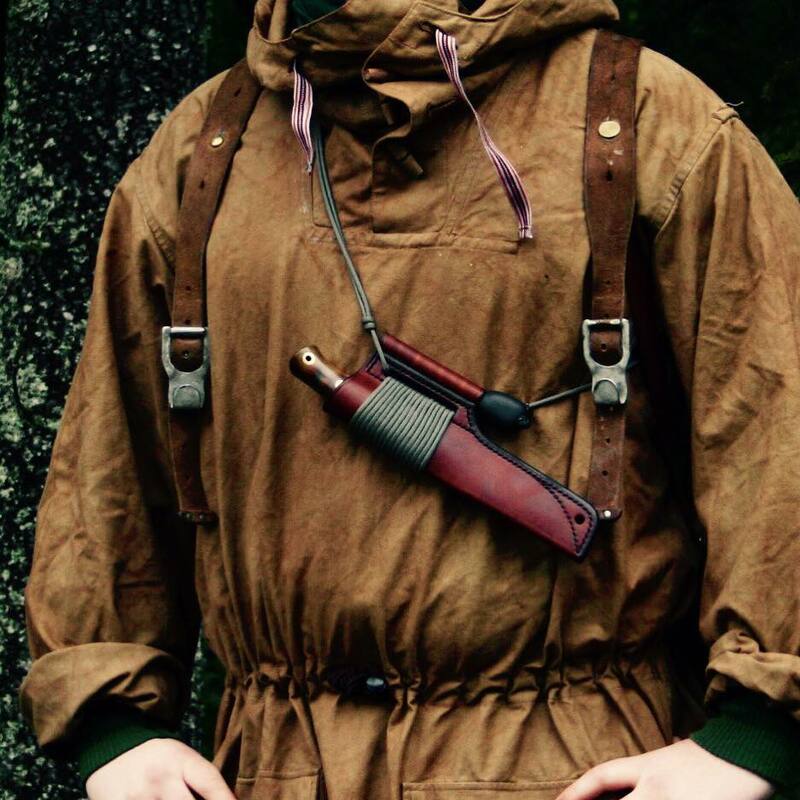 Besides the above ways to carry a knife there are of course a wide range of alternatives like; boot dagger, shoulder holster, inner pockets, machete on the back or the diver's knife on the fore arm. These examples are all some what exotic, so therefore I wont get into these deeper than mentioning them. However; one alternative worth mentioning a bit more is the shoulder strap. 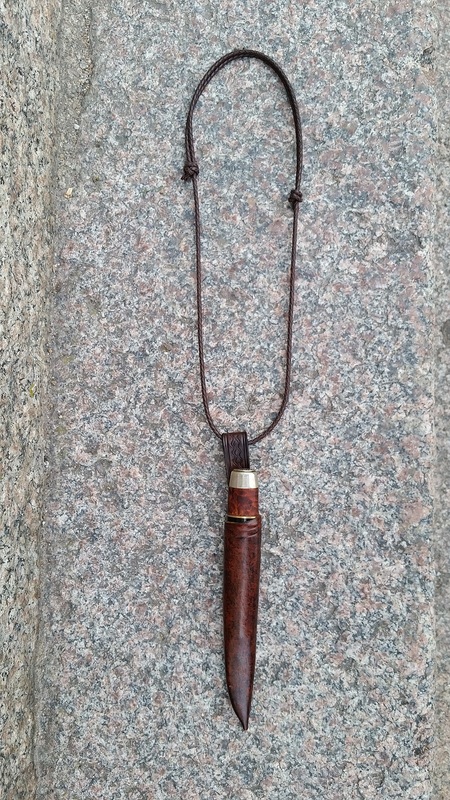 This is a longer adjustable cordage enabling me to hang my knife over the neck and shoulder. This way of carrying is in a way related to the neck knife carry, making the knife reachable outside my wither clothing. In the picture below you can see my friend Jonathan Sandén carrying a typical modern bushcraft knife hanging in a shoulder strap. 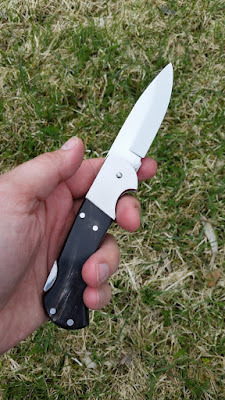 Regardless of what carry system or in what way i choose to carry it; I always have the habit of now and then touching my knife to make sure it's still there. This is the best way to avoid loosing a good tool. I also want to take this opportunity to emphasize how important it is to pull out your knife in a controlled and safe manor avoiding cutting oneself or others or damaging the carry system it self. I always try to keep track of my fingers and my friends when pulling out my knife and as soon as I don't use the knife; put it back in the sheath. 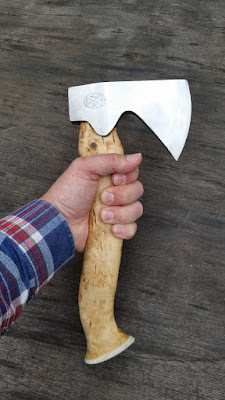 A good rule of thumb is to always push the back of the blade against the sheath so that the cutting edge don't damage the sheath and it's straps. 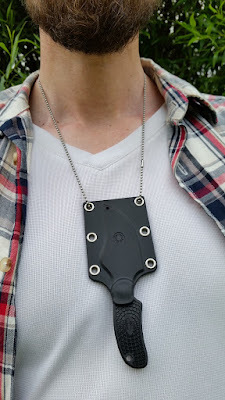 Below follows some examples on how I carry my blades when out and about doing different activities. I hope this article was helpful and inspiring to you. 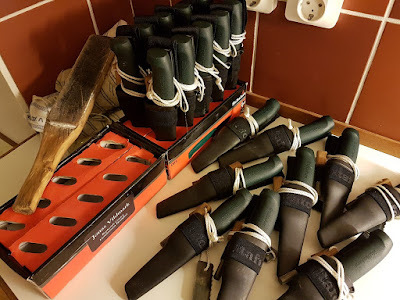 Perhaps the contest may help you in future edge tool choices and how to carry your tools. If you have any feedback or questions; please don't hesitate contacting us. Please follow your local laws regarding knife carrying and good luck carrying your tools with respect and concern to each other and our history. The Victorinox Tinker Small is a two layer SAK (Swiss Army Knife) with a very practical and easy to carry design. The Tinker Small has become one of my favorite EDC's. 12 nice features in a 54 g multi tool measuring 14 x 84 mm. In this moment Jonas Vildmark is field testing this knife, so please come back again soon to see more info and our thoughts about the tool. 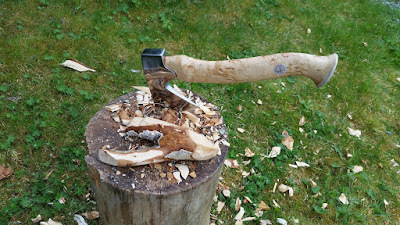 When it comes to heavy duty tasks I often turn to the Hultafors OK1. 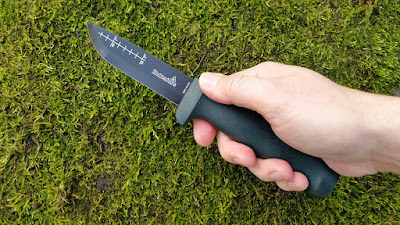 This is a robust yet discreet rough neck well suited for tough bushcrafting and survival training. The black 93 mm long Japanese carbon steel blade has a Scandi grind and the low hanging sheath comes prepared to hold a ferro rod. 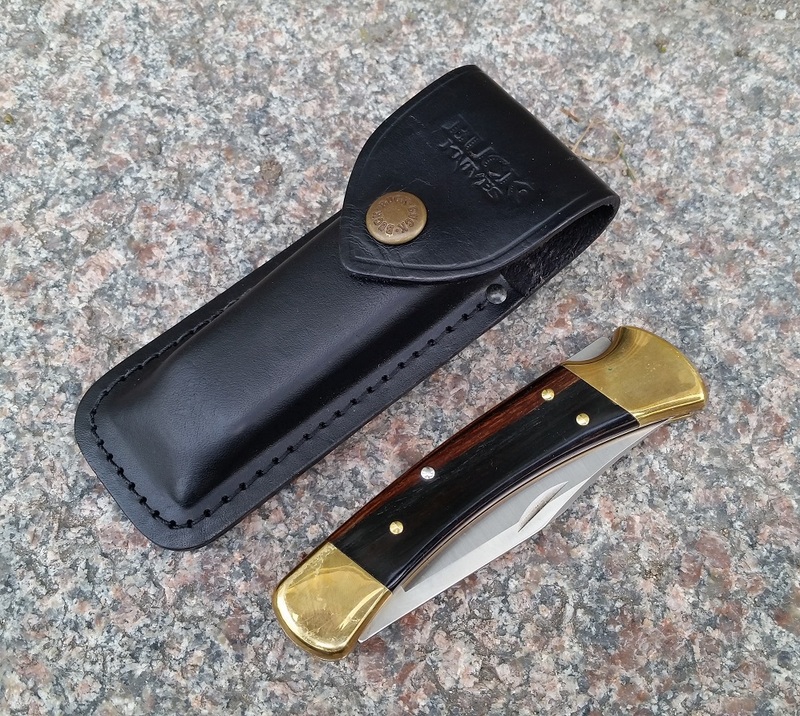 The OK1 is also Jonas Vildmark's official training knife, lent to our class participants. You get a lot of bang for the buck when choosing the OK1 and well maintained it'll last for a very long time. 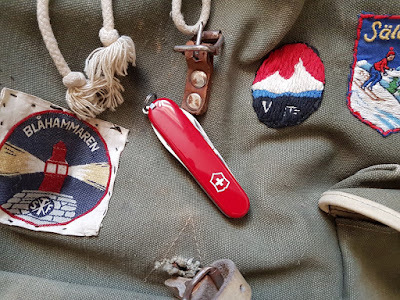 Please come back to this post again soon to see more info and our thoughts about the knife. You can also read about the Hultafors Outdoor Series in one of my mag articles inside the Vapentidningen, click HERE. Hultafors Hantverkarkniv RFR is the stainless steel version of the Hultafors Hantverkarkniv HVK. 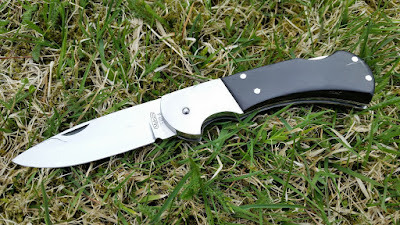 The RFR has a blue plastic handle and a stainless steel blade. The HVK has a orange handle and a carbon steel blade. This is a handy all-round knife with a 2,5 mm thick and 93 mm long blade with a 57–59 HRC. 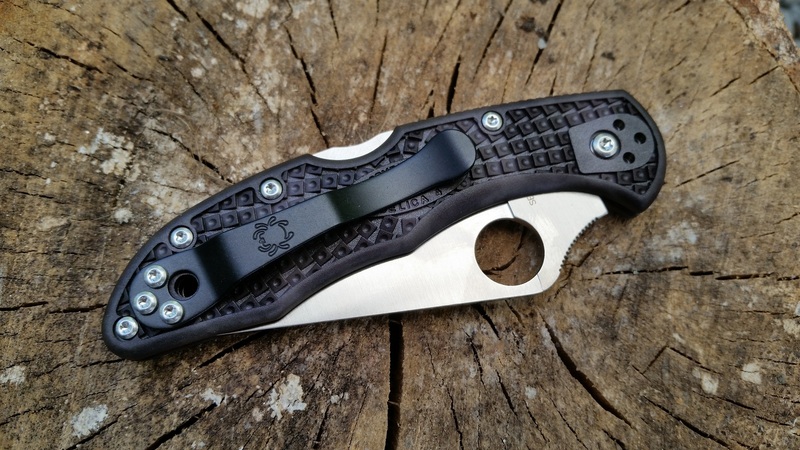 The Spyderco ARK H1 is a small fixed blade neck knife from Spyderco. The knife is designed by the American soldiers John Shirley and Sam Owens. They saw a demand for a light weight and easy accessible defense blade to always have around ones neck, even when in the shower. ARK is short for; Always Ready Knife, and the knife uses a 65 mm long clip point blade made of the very stainless H-1 steel. The total weight of this tool is only 57 g.